When a tree’s growth begins to interfere with utility lines, that’s when it’s time to have it trimmed. 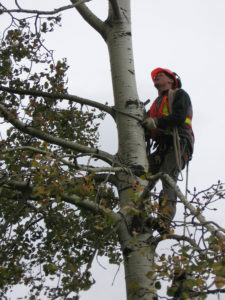 At ArborCare Tree Service, we offer Utility Tree Trimming service to companies across Western Canada (Calgary, Edmonton, Kelowna, Vernon and surrounding areas) by making sure lines are clear, while still preserving the surrounding environment. We know which situations demand manual, mechanical, or herbicidal management methods, and you can rest assured we’ll bring our expertise to each job to make sure it’s done correctly. There are many reasons why your utility company should consider hiring our arborists for our professional tree trimming services. Not only do trees often grow over and hide power lines, which is a danger in and of itself, but they can also become conductive of energy when caught up in the power lines. Broken branches and tree limbs can also down power lines, increasing the potential for electrocution among your customers. Having branches too close to power lines can also cause avoidable service interruptions and fires. Don’t let this happen to you! If you have questions about the work we can perform for your utility company, or if you’re ready to get started with our line trimming services, we invite you to contact us today to request a free estimate.